It’s summertime in the South and with that comes long, lazy days that stretch into the evening and early night. The hot, humidity of the day with the sun beating down unmercifully turns into a slightly cooler evening as fireflies flit past for Nature’s best light show and bugs sing a symphony in the grass. There’s nothing better on a warm summer evening than dining outdoors and grilling by the lake. 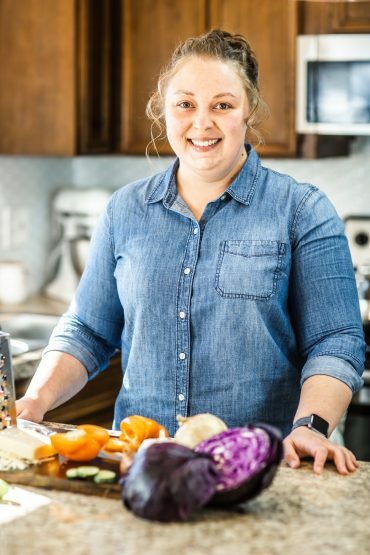 If you’re anything like my family, we love simple meals that can be cooked indoors or grilled outside. These Low Carb Buddha Bowls fit the bill for a perfect, dinner in a bowl kind of summer evening. 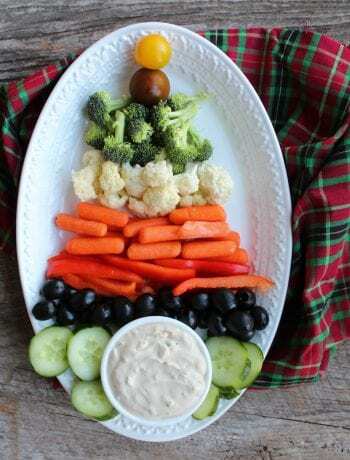 I cooked the ingredients for our low carb buddha bowls in the oven on a sheet pan but this would make a perfect meal to throw in a pan on the grill and enjoy on the back porch while the kids run through the sprinkler and you relax with a glass of ice cold sweet tea. 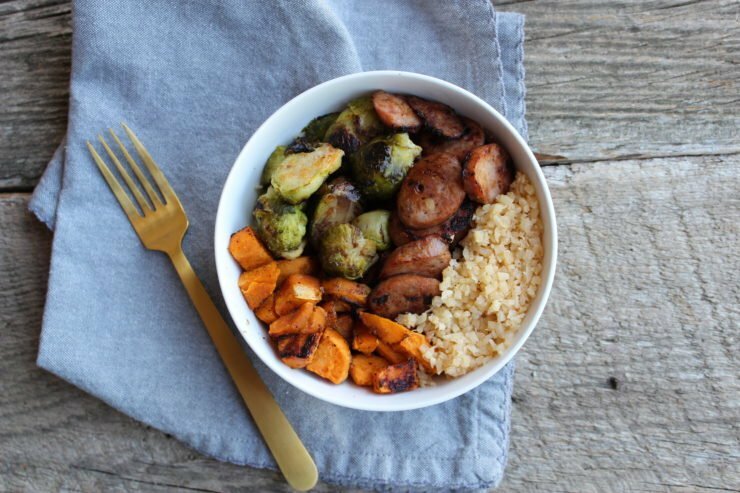 If you’re following a low carb or Keto diet, these Buddha bowls are perfect for you and the best thing is that the entire family can enjoy them with you! This is also just a great, whole foods meal if you’re not overly concerned with the carbs but just want to eat cleaner and healthier. 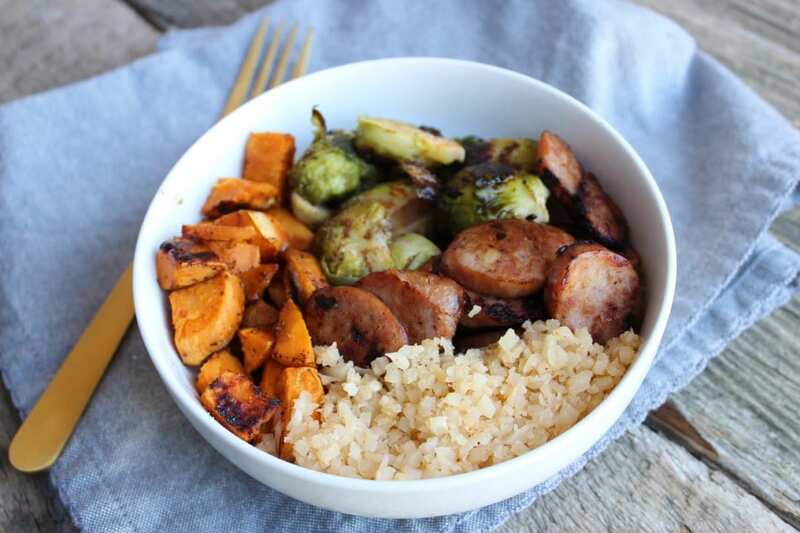 In these Low Carb Buddha Bowls, I use simple, whole ingredients such as sweet potatos, brussles, chicken sausage, and cauliflower rice along with a balsamic vinegar drizzle to create an easy and tasteful combination of flavors including sweet, salty, and tart. 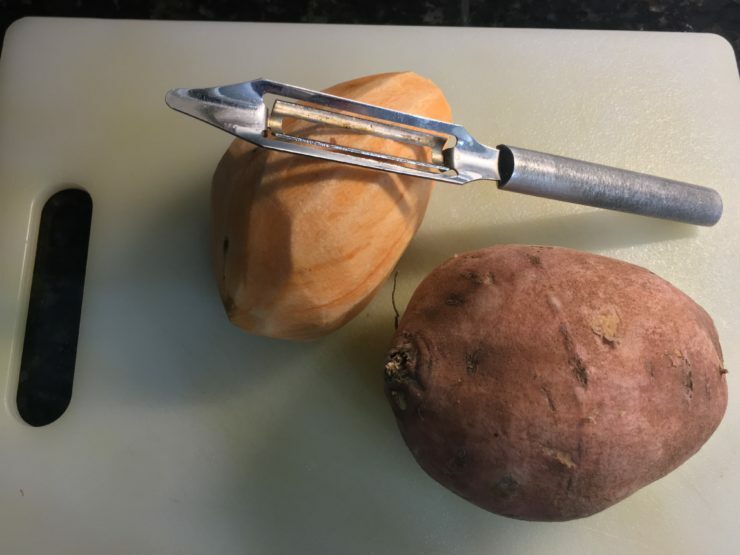 I started out by peeling two medium sized sweet potatoes with a potato peeler. Once you get the skin removed, rinse them under cool water to remove any dirt that might be lingering behind. 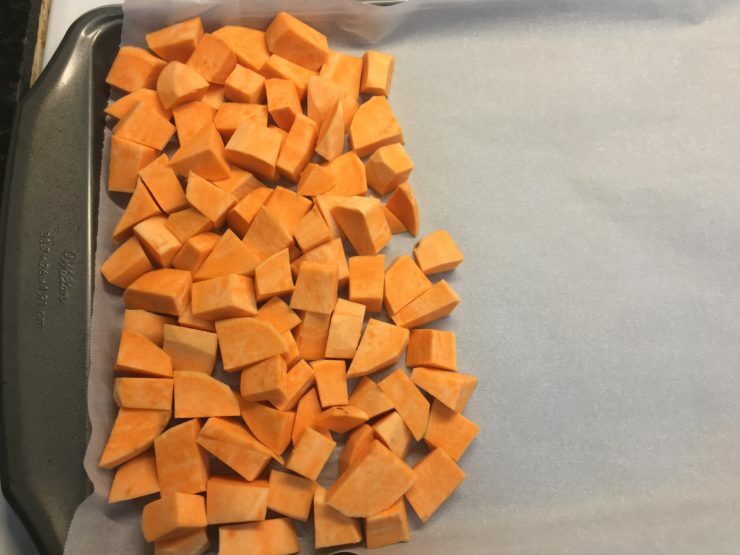 Once your sweet potatoes are peeled, dice them into bite sized chunks and place them on a sheet pan that has been lined with parchment paper or place them in a grill-safe pan. Now you want to grab a bag of frozen and thawed brussels sprouts and cut them in half. Once they’re halved, add them to the other side of the sheet pan. 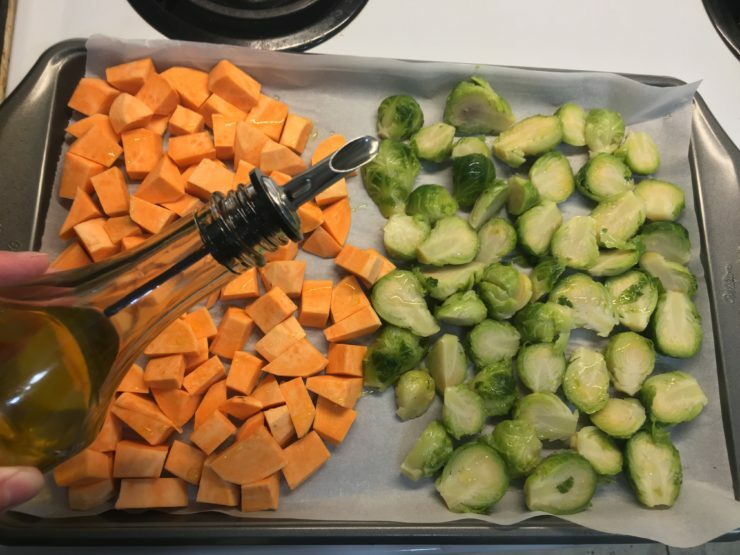 You can also use fresh brussels sprouts if you desire, just rinse them in cool water before cutting them in half and adding to the sheet pan. 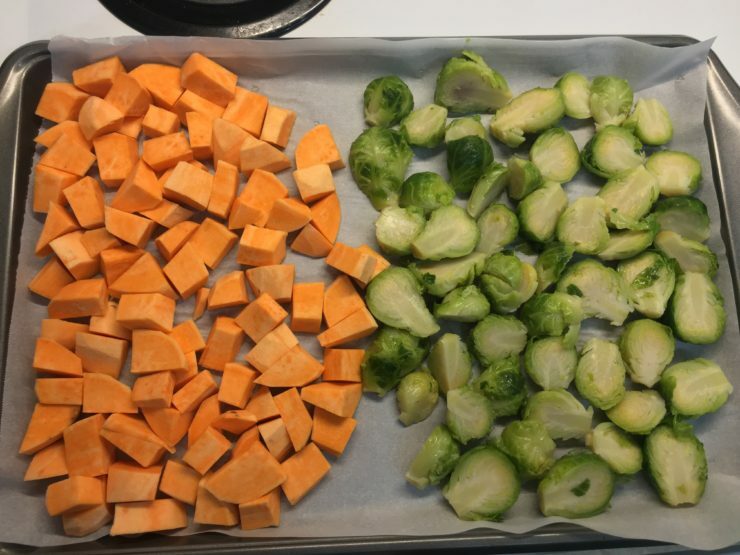 Once the sweet potatoes and brussels sprouts are added to the sheet pan, drizzle them lightly with your healthy fat. I used organic, extra virgin olive oil but avocado oil is also a good choice. I like to keep the seasonings simple with reduced sodium seasoned salt and Old Bay Seasoning. 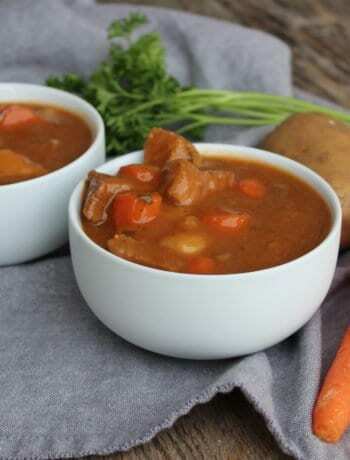 These two combined give the veggies a wonderful flavor! There are several brands of Chicken Apple Sausage available, and it really doesn’t matter what brand you choose to use. I use my local grocery store brand because it’s cheaper than the name brand’s and tastes just the same! Remove the sausage links from the packaging and then use a knife to remove the casing from the links before slicing. 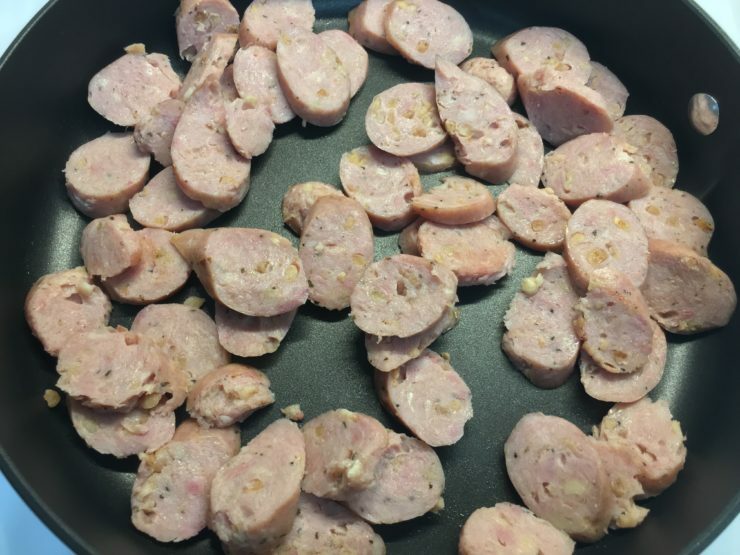 Once the casing has been removed from the chicken sausage, slice each sausage link into rounds and place in a large, hot skillet over medium high heat. I like to cook my sausage until it blackens slightly because I just love the flavor this blackening gives the sausage! Don’t forget to stir the chicken sausage often as it cooks to ensure that both sides blacken! 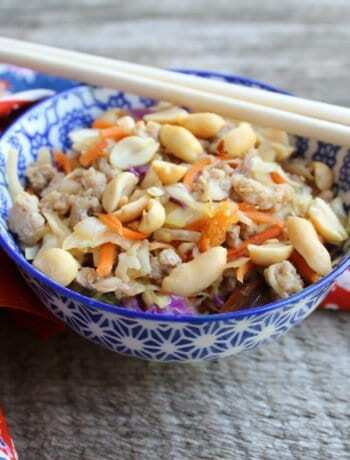 Once the sausage is cooked, remove it from the pan and add a bit of pure sesame oil. Heat the oil over medium high heat until hot and then get ready to add in the cauliflower rice. But wait! There’s also Cauliflower Rice! Add in one bag of plain, frozen, riced, cauliflower and stir it into the hot sesame oil. Now go ahead and season your cauliflower rice with a sprinkle of reduced sodium seasoned salt and two tablespoons of organic, low sodium beef broth. 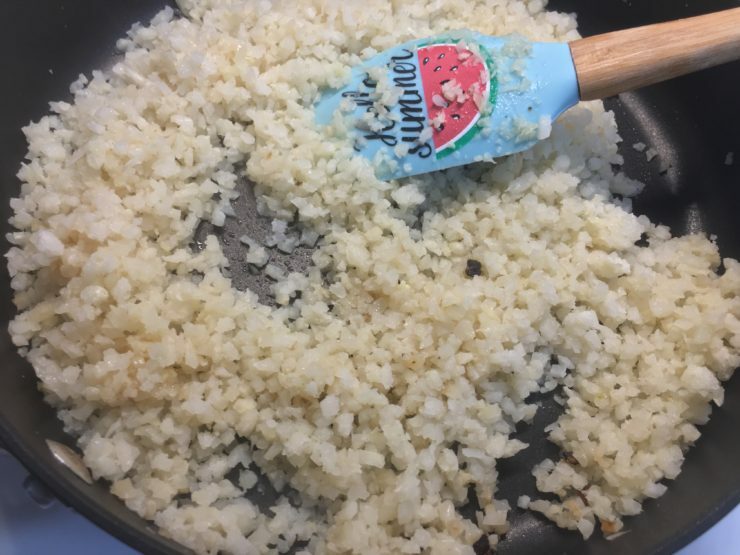 Don’t worry, the beef broth won’t make the rice nasty and soggy and it really just gives this otherwise very plain cauliflower rice such a wonderful flavor! Time to dig in to that Low Carb Buddha Bowl! This is where I drizzled the contents of my Buddha bowl lightly with balsamic vinegar however, if you’re not a fan of balsamic vinegar, just skip that part. If you DO love it, go for it! The balsamic vinegar really gives the veggies and sauce a great tangy bite. Sit back with your low carb Buddha bowl, grab a glass of sweet tea or iced herbal tea and enjoy the evening because you’ve earned it! Here’s to a happy and healthy summer to all of us! 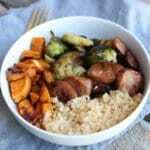 A delicious, healthy, combination of roasted vegetables, blackened chicken apple sausage, and cauliflower rice. Preheat oven at 400F and line a sheet pan with parchment paper. Wash and peel both sweet potatoes and cut into bite sized chunks. 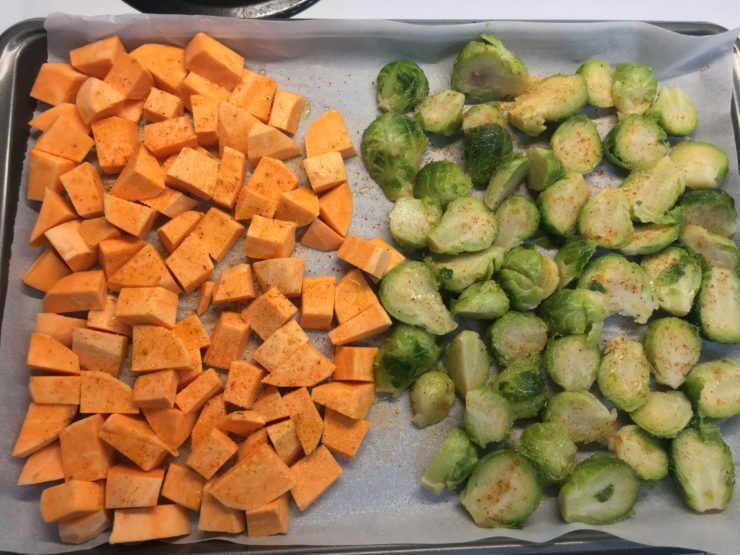 Place the sweet potatoes on one side of the sheet pan. Thaw the brussels sprouts, slice in half, and place on the opposite of the sheet pan. Sprinkle the Old Bay Seasoning over the veggies and drizzle with the olive oil. Place in the oven and roast for 20 minutes or until veggies are tender and roasted. 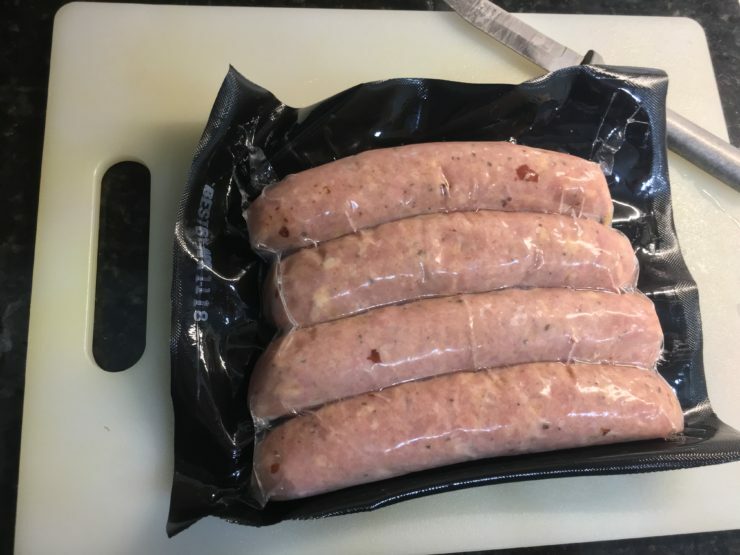 12 minutes before the veggies are ready, remove the chicken sausage from the packaging and use a knife to remove the casing from the chicken sausage and cut each sausage link into rounds, on the diagonal. 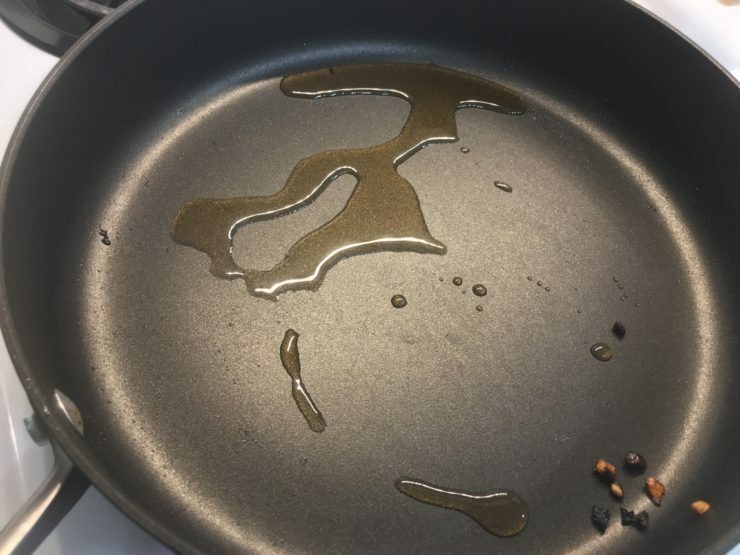 Place the chicken sausage in a large, black skillet and cook, moving frequently, until the chicken sausage starts to blacken. 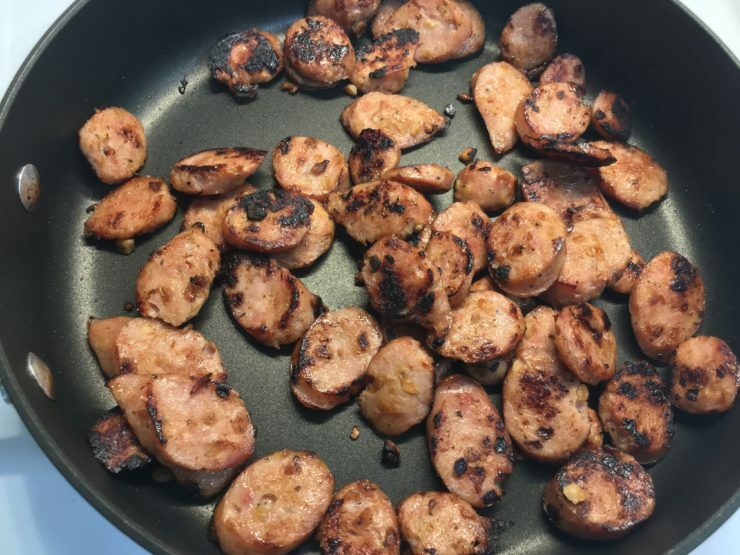 Once the chicken sausage is cooked, pour the sausage into a bowl or on a plate and add the sesame oil into the skillet that the sausage cooked in. Add in the frozen cauliflower rice and season with seasoned salt and beef broth. 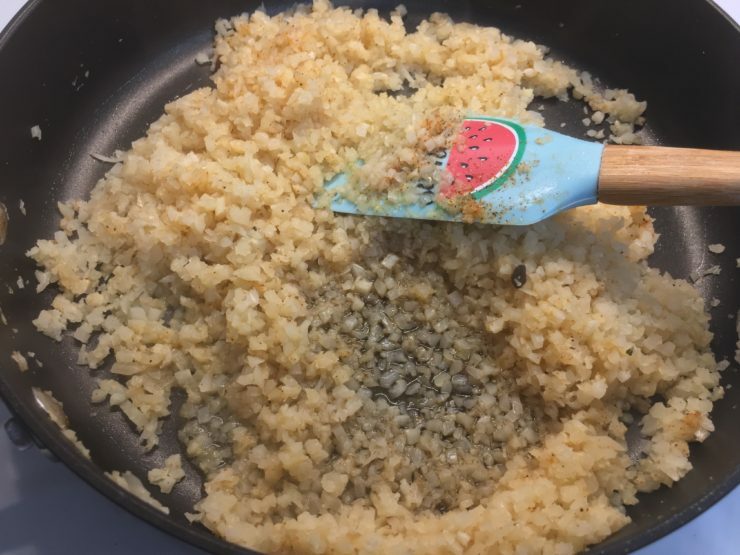 Stir the cauliflower rice until all ingredients are well mixed and cook until tender. (about 3-5 minutes). 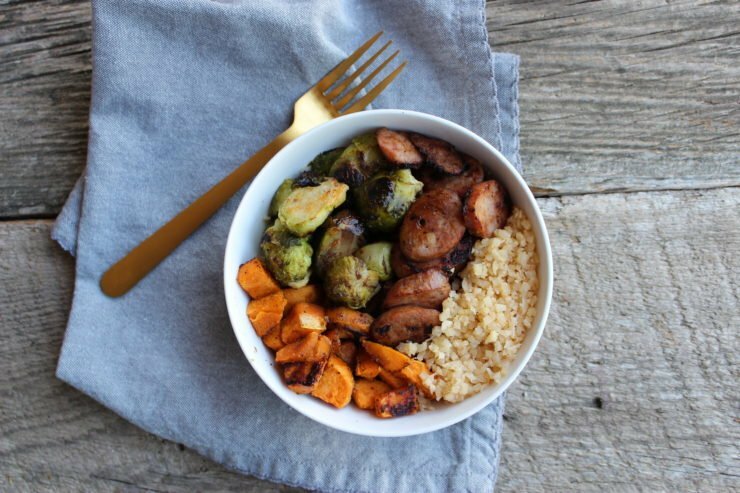 Remove the roasted veggies from the oven and assemble the Low Carb Buddha Bowls with equal parts roasted veggies, chicken sausage, and cauliflower rice. Enjoy as is or drizzle with balsamic vinegar.